Today I’m gonna be showing you some of the most useful, super handy crochet tips and tricks. 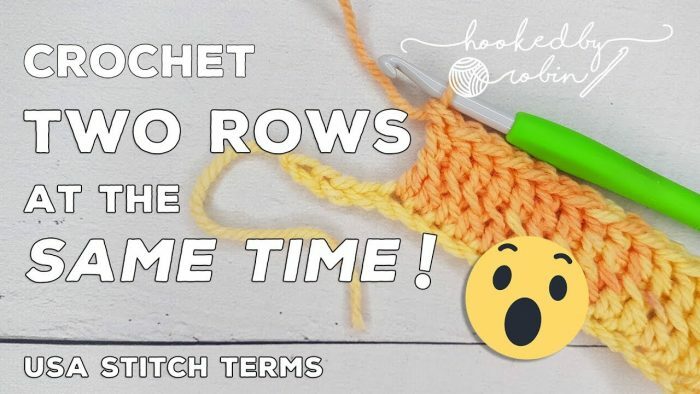 If you want your project to grow super fast and save some of your precious time, I will teach you how to crochet 2 rows at the same time using a very simple and easy to follow tutorial with the step by step video instructions. As you already know, besides some basic crochet techniques and different kind of stitches there are also many important tips and tricks. That’s why I always get so excited whenever I discover some new ways that help me improve my crochet skills, like this one here. I think this is a perfect technique that works very well on blankets on a large scale if you want to make something really fast. Just make sure you master this simple and easy crochet tip, learn how to crochet two rows at a time and make your crocheting process much more enjoyable and entertaining. There is no doubt you will handle it without any difficulties, especially with this helpful step by step guidelines. Enjoy yourself and always feel free to share your experience with us. This is possibly the fastest way to crochet blankets ever? Could this be the ultimate time-saving crochet hack for you? definitely yes. Just follow the step by step video tutorials and take your crochet skills to another level! Video tutorial here shows how to crochet two rows at the same time. This is a quite simple, very helpful and “must know” technique that’s definitely going to improve your crochet skills. Please, always feel free to share your opinion and ideas with us and other crochet lovers in a comment section below. Good luck!